This bike tour is rather unconventional but definitely memorable. Want to take in Bangkok after dark? This tour will definitely be one for you. You’ll get to see the city brightly lit with brilliant color. It’s a wonderful way to cycle without being out in the hot sun. 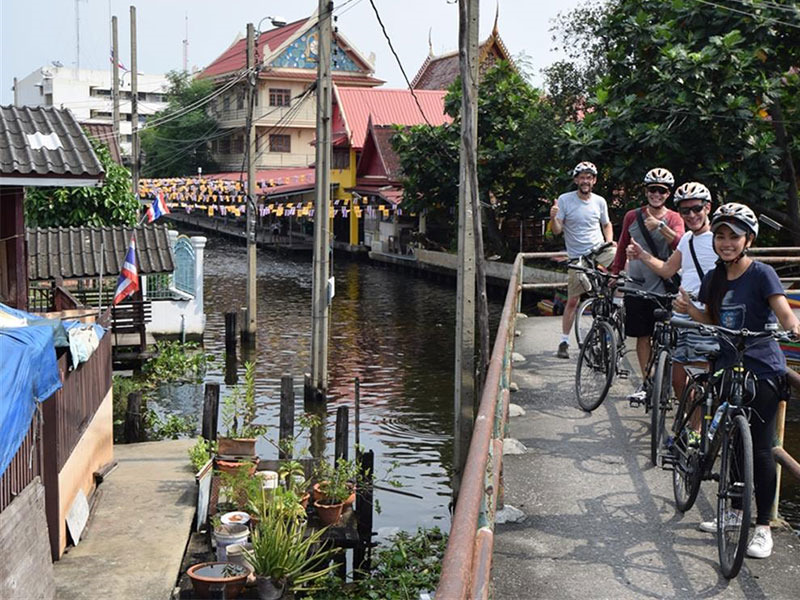 The Bangkok Night Bike tour begins at 6 in the evening, and will go through small alleyways, passing gorgeous temples, vivid flower markets, and even across the river so you can take in Wat Arun after dark. It’s only 13km, so you’ll still have energy to hit the nightlife nearby afterwards. There’s a lot more to Bangkok than concrete and tall buildings. 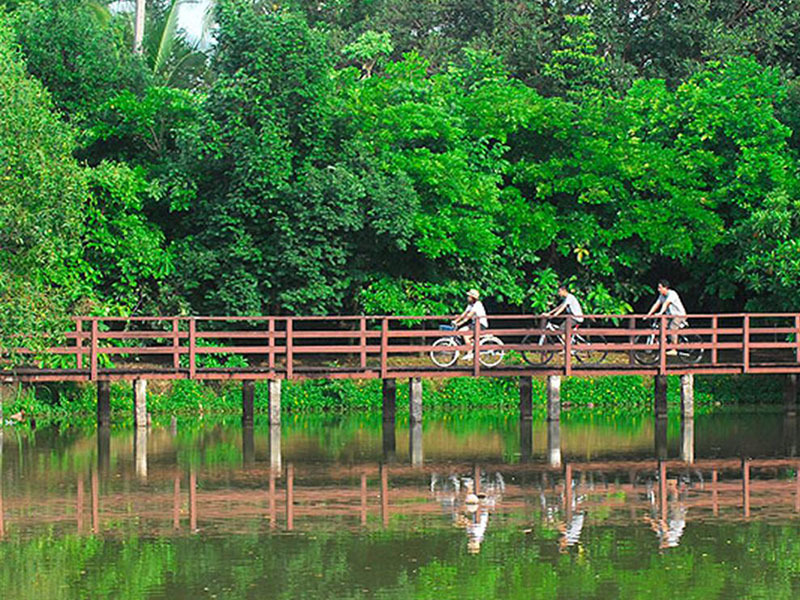 Bike Bangkok’s Hidden Oasis will show you another side of the city, hidden away beneath the green foliage across the river. This area is known as Bang Krachao, the green lungs of Bangkok. You will get across the river by ferry and bike through nature and traditional wooden houses. It won’t even feel like 2018 anymore out here. You’ll pass mangroves, orchards, small villages, and local temples and in no time at all, you’ll complete the 20km stretch wishing that you could have spent more time in the greenery. When they say “historic,” they mean historic. 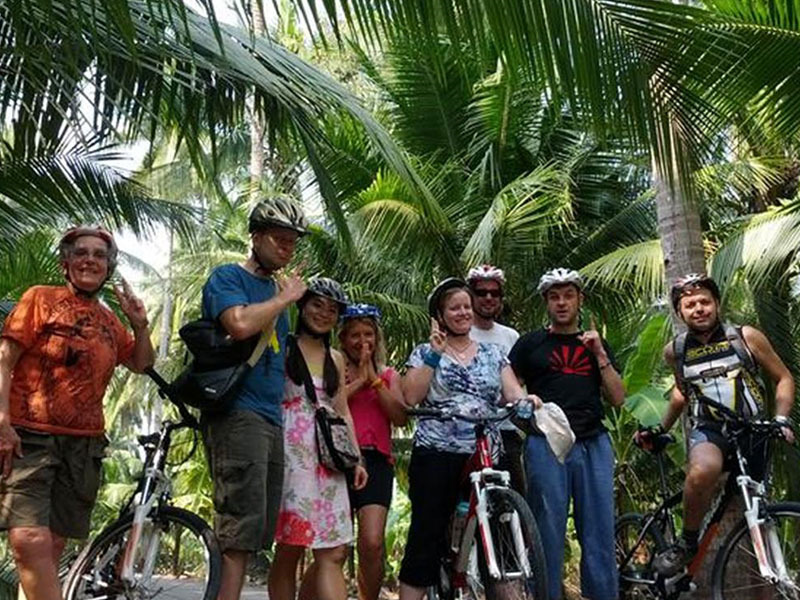 Travelers who want to see authentic local Thai life will get to do so on the Bike Historic Bangkok tour. You will cruise down small streets and little roads that you otherwise would have never spotted. You’ll pass Buddhist temples and Muslim mosques, see small neighborhoods live together in peace and harmony. Only when you are nearing the end of the tour will you see more people and more “city” as you approach the Grand Palace and the monumental Swing. 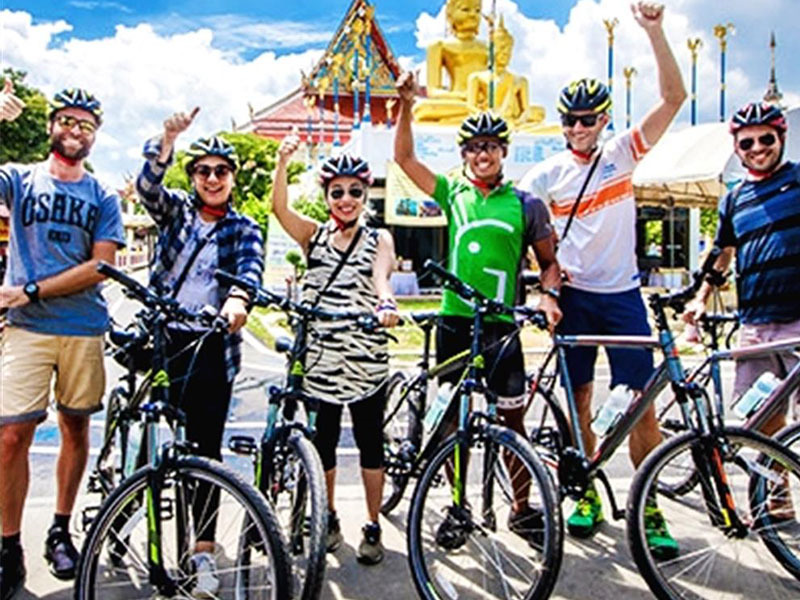 The tour takes approximately four hours, and you will get a chance to see Bangkok in a way you never have before. What better way to admire the Bangkok skyline than from up high? Instead of heading for the rooftop bars, go on the Twilight Sunset Ride tour. 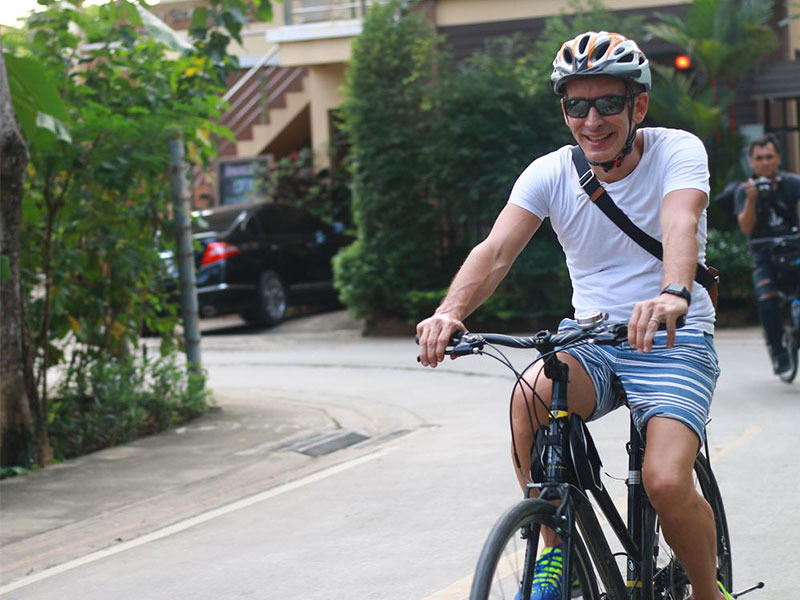 Even biking beginners will be able to make it through this ride. It only lasts three hours, but it covers quite a bit of ground and comes with lots of photo opportunities. You’ll start by weaving through alleyways and small streets before ending up at a gorgeous, intricate temple where the largest standing Buddha image in Bangkok stands. You’ll also get to stop and see quite a few cultural stops - the Thai custom of fish feeding, a stop at the royal barges, the Samakhom throne hall, and even to visit one of Thailand’s well-known universities. The last stop is the Golden Mount, where you can take in the spectacular sunset view from high above. If you’re looking to visit some of Bangkok’s best temples, Go Gold’s Bangkok Temple Tour is one of the best. It spans a tiring eight hours, but the exertion is definitely worth it as you will be able to see more in a day than you would by yourself. You’ll kick off the tour at the Old Customs house. Then, after passing through the historical Chinatown, you’ll reach the Phra Nakhon area and get to view temples like Wat Pho, Loha Prasat, and even Sanam Luang. 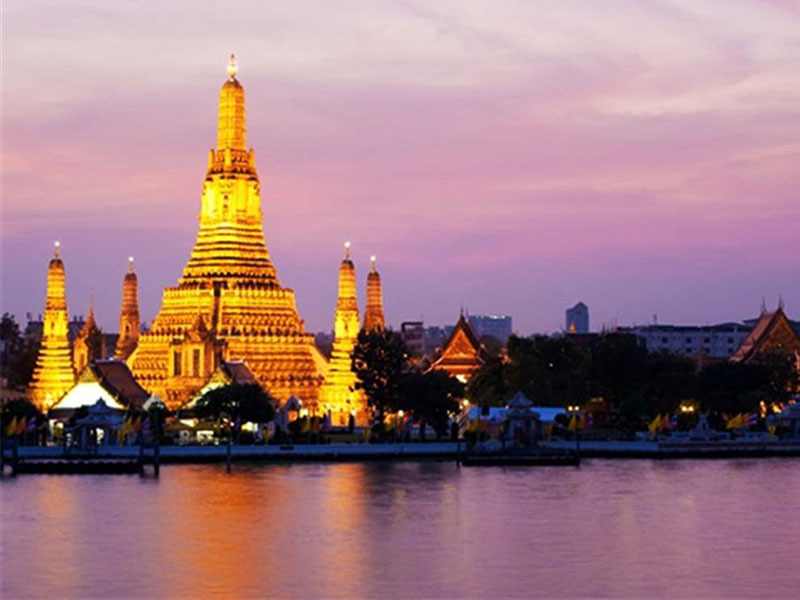 You’ll get to cross the Chao Phraya river to take in the majestic Wat Arun, before finally heading back. If you want to take in as many temples as possible during a short trip, this tour is perfect. 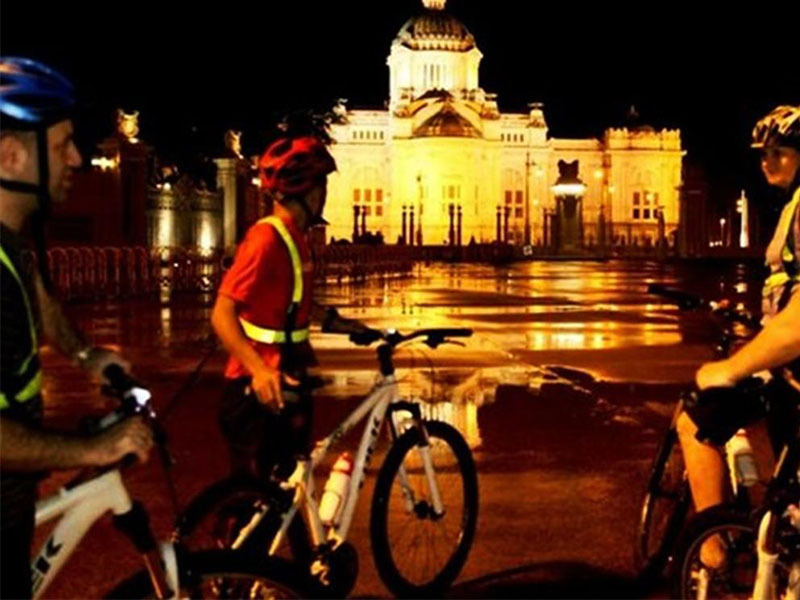 The Co Classical 3-Hour Bicycle Tour is a wonderful way to see the way locals live their lives in the city. There won’t be any touristy nonsense here. You’ll cycle through the bustling roads of Chinatown and watch the vendors hustle around. Cruise down the twisting alleyways, the vivid markets, and the quiet neighborhoods until you reach Thonburi, where you’ll get a look at life on the outskirts of the city. It’s definitely a change of pace, and it’ll give you a new look into the lives of the locals. This tour combines two of the best things about travel - sightseeing and food. What better way to see Bangkok, right? You’ll cycle about the city, ending up at the most inconspicuous street vendors who will serve you up amazing dishes that you probably would not have chosen yourself. After the street food, you’ll get to visit the largest 24-hour fresh market where food hawkers all over the city go to buy fresh ingredients for the next day. At the end of the tour, you’ll get to sit down to a fantastic dinner to fuel up after all that energy loss. You can never get enough of Bangkok after dark. With this tour, you’ll get to see it in a completely different way - all lit up after vendors and people of the night come out after the sun goes down. There will be a stop at a temple, where you’ll take in the pungent smell of incense before smelling the delicious food scents from the street stalls all over town. You’ll get to visit the flower market, where people push around giant carts of beautiful flowers of the brightest colors. Cycling across the river, you’ll get a view Bangkok’s lights from a little further away. When you return back to your place of accommodation, it won’t be surprising if you are still dazzled and having trouble adjusting back to reality after a night out in Bangkok.